Anemone coronaria - Poppy Anemone growing in a modern garden. 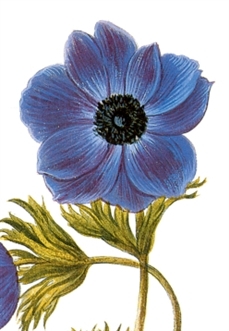 Anemone coronaria - Poppy Anemone from Private Collection, Broderie Perse Bed Set, c. 1840. Anemone coronaria - Poppy Anemone (published as Anemone tenuifolia) Basilius Bessler, Hortus Eystettensis, vol. 1: Primus ordo collectarum plantarum vernalium, t. 34, fig. III, 1620. 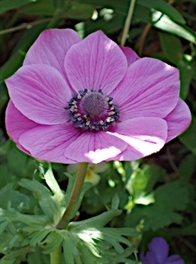 Description: Anemone coronaria (Poppy Anemone) is a member of the Buttercup family (Ranunculaceae). The Hortus Kewensis, ed. 2, vol. 3 lists this plant, native of the Levant, as introduced to cultivation in Britain in 1596.